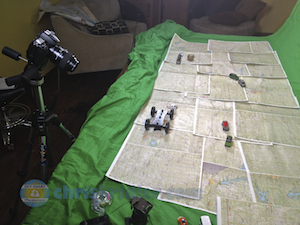 Here’s the set for ‘The Chase,’ which used several toy storm-chaser cars as its stars. “The Chase” contains some 1400 still frames with short bursts of live video as it tells the story of a storm chase using toy cars, windup toys and cottonball clouds. The “set” was created on our pool table with maps and a green screen. I shot the images using a tripod and also a tabletop dolly, following a rough storyboard outline. And a piece of music by Kevin MacLeod set off the action perfectly. 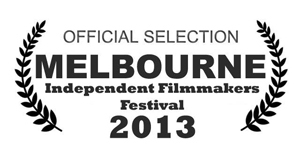 This film won the best animation award at the 2013 Melbourne Independent Filmmakers Festival in Melbourne, Florida.